Designed with crafters in mind! Stitchers, quilters, knitters and makers of all sorts. The Year of the Crafter coloring book contains thirteen original hand drawn illustrations of crafters doing what they love best! 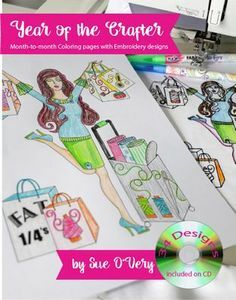 Each month is represented by a crafter with a BONUS fabric shopping girl! Each illustration appears in two sizes: large and half size, both suitable for framing when complete.